Researchers at Delft University of Technology have created a quantum circuit that enables them to listen to the weakest radio signal allowed by quantum mechanics. 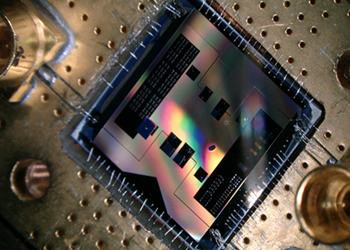 This new quantum circuit opens the door to possible future applications in areas such as radio astronomy and medicine (MRI). It also enables researchers to do experiments that can shed light on the interplay between quantum mechanics and gravity. The results have been published in Science. We have all been annoyed by weak radio signals at some point in our lives: our favourite song in the car turning to noise, being too far away from our wifi router to check our email. Our usual solution is to make the signal bigger, for instance by picking a different radio station or by moving to the other side of the living room. What if, however, we could just listen more carefully? Weak radio signals are not just a challenge for people trying to find their favourite radio station, but also for magnetic resonance imaging (MRI) scanners at hospitals, as well as for the telescopes scientists use to peer into space. In a quantum ‘leap’ in radio frequency detection, researchers in the group of Prof. Gary Steele in Delft demonstrated the detection of photons or quanta of energy, the weakest signals allowed by the theory of quantum mechanics. For a kid on a swing these ’quantum steps’ are so tiny that they are too small to notice. Until recently, the same was true for radio waves. However, the research team in Delft developed a circuit that can actually detect these chunks of energy in radio frequency signals, opening up the potential for sensing radio waves at the quantum level. From quantum radio to quantum gravity? Beyond applications in quantum sensing, the group in Delft is interested in taking quantum mechanics to the next level: mass. While the theory of quantum electromagnetism was developed nearly 100 years ago, physicists are still puzzled today on how to fit gravity into quantum mechanics.